Hi! My name is Alycia, and I’m a dishaholic. An organized one, but a dishaholic just the same. When I owned my fine rentals business there was no shortage of available space to store all my pretty things. Back then I didn’t have dishes, but there was PLENTY of other “stuff.” In addition to basement and attic storage in my shop, I had warehouse space the size of 5 single-car garages. Any overflow was kept at our home. OK…not too bad. 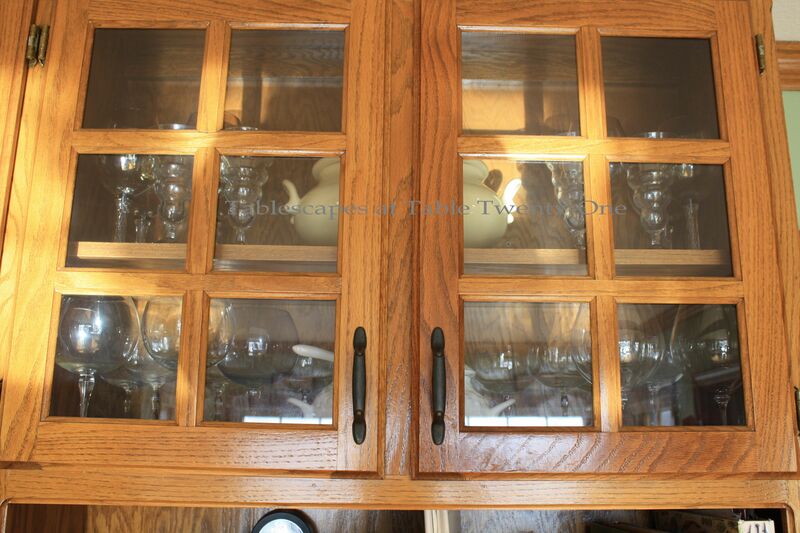 This is a logical place for dishes: the china cabinet in the dining room. 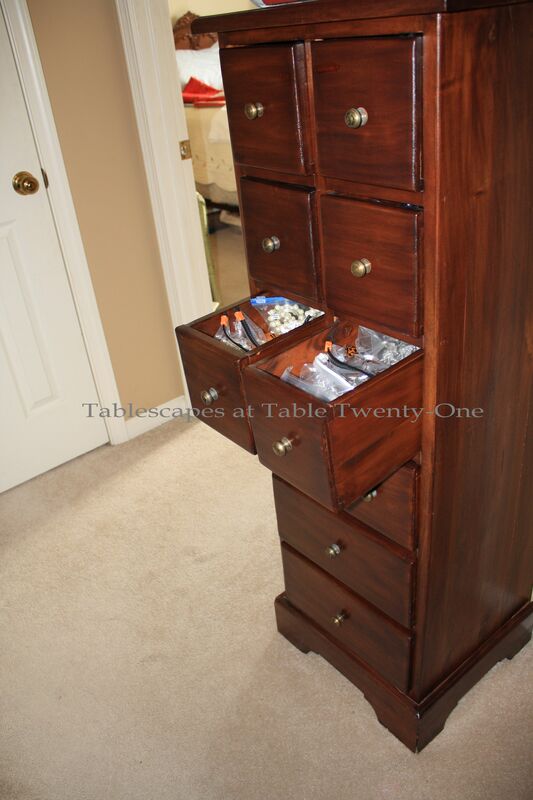 The 3 little drawers on the bottom contain place card holders. But I have 83 styles/patterns of dishes…where are the rest? 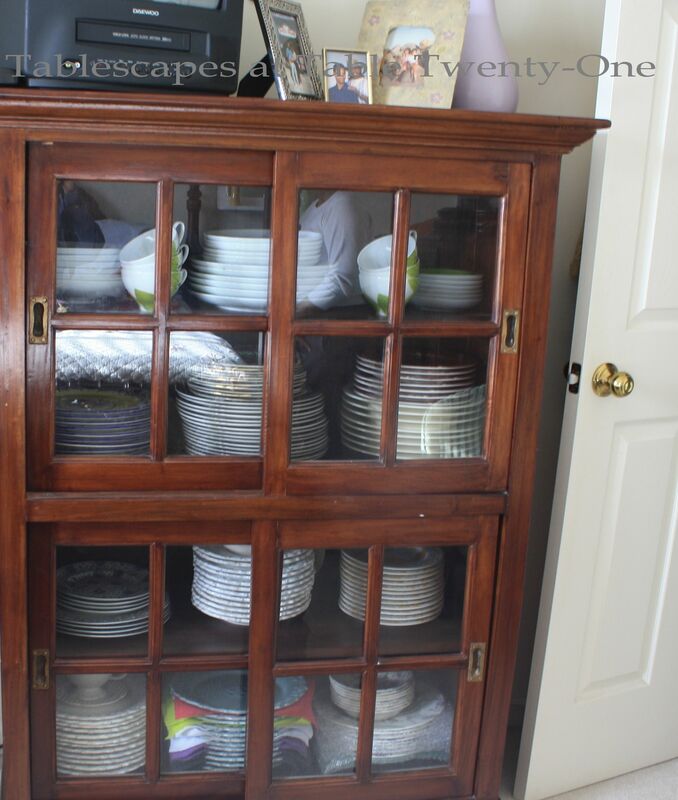 Then there are the 8 drawers of the dining room buffet loaded with flatware, serving utensils, placemats and specialty napkins. Still not too bad. Let’s move into the foyer. The drawers of this apothecary chest in the foyer hold about half of my 76 sets of napkin rings (that help jazz up 90 different styles of napkins!). Let’s step over into the library…. 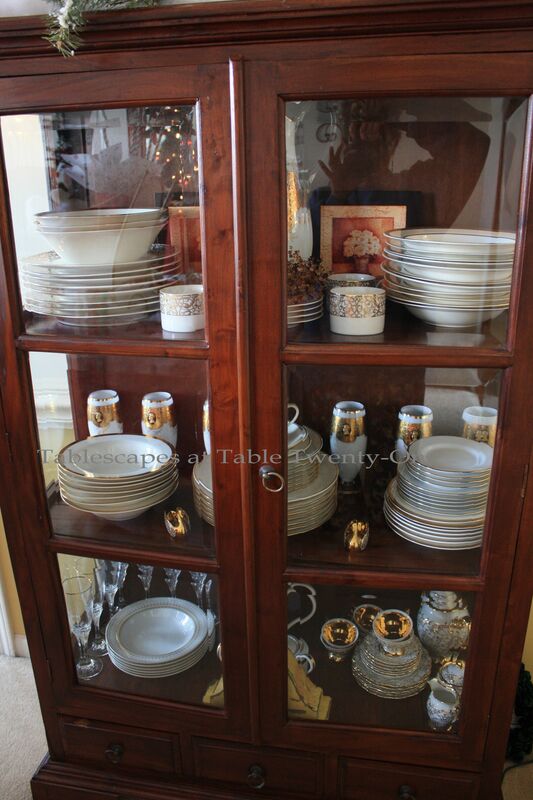 Our reproduction Louis XVI vitrine houses crystal, silver and about half of the 24 sets of flatware in my collection. 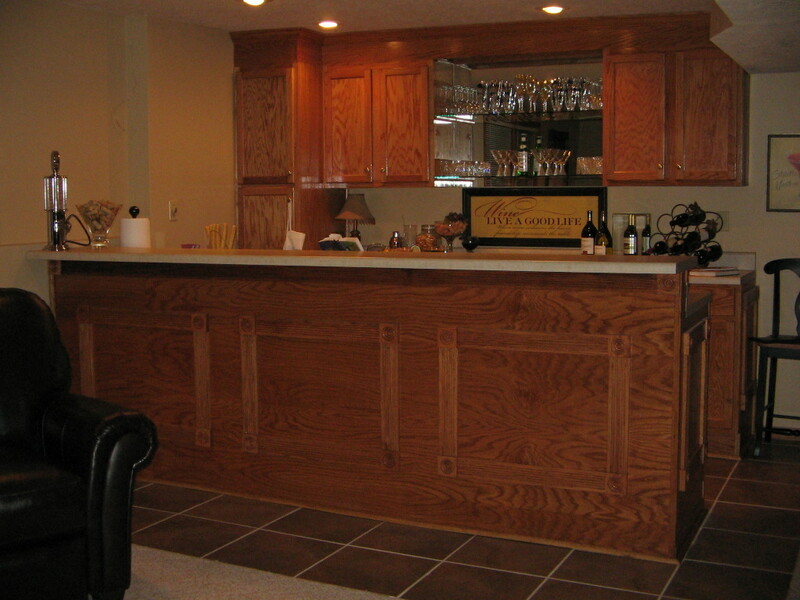 Moving on to the family room area…. 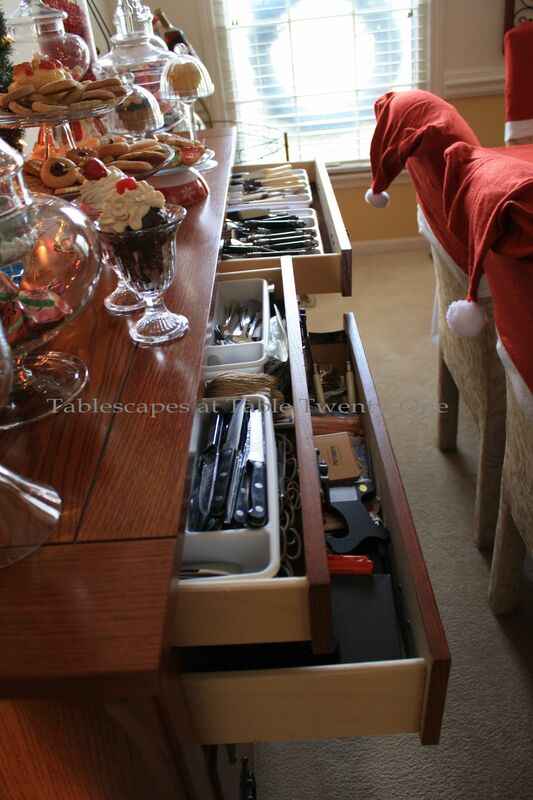 The bar in the family room displays a few stemware sets and stores several pitchers down below. 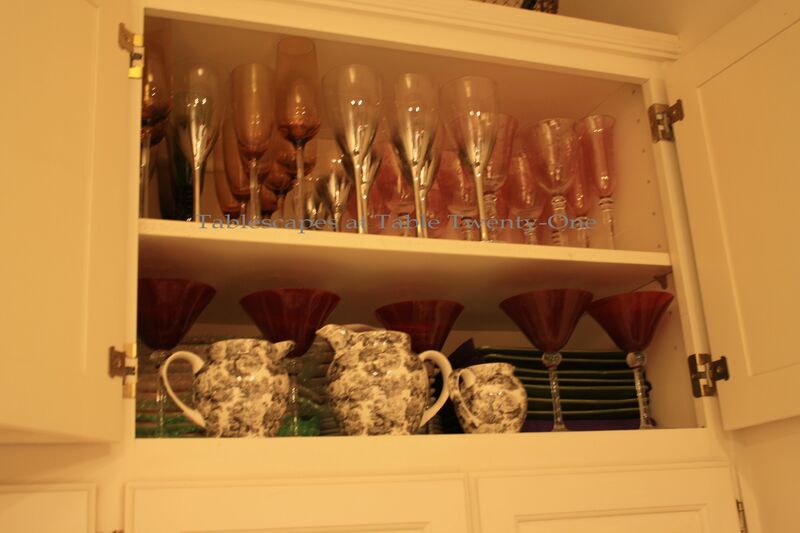 I have 84 different sets/styles of glasses and stemware, although I tend to use 5 or 6 favorites over and over. 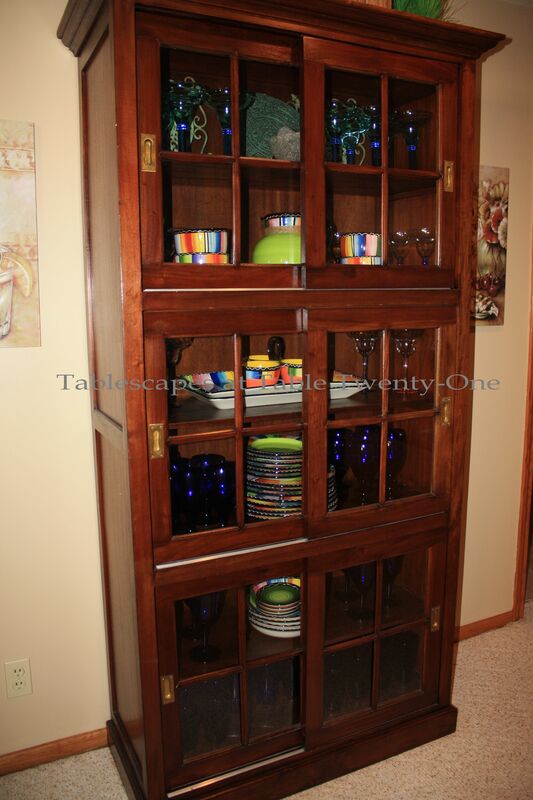 Four 2-shelf cabinets under the family room bookcases store most of my 41 sets of chargers. And we’re walking, we’re walking……. What is supposed to be a broom closet right off the kitchen stores another round of china as well as teapots and serving dishes. I’m bored with this floor. Let’s move down to the lower level. 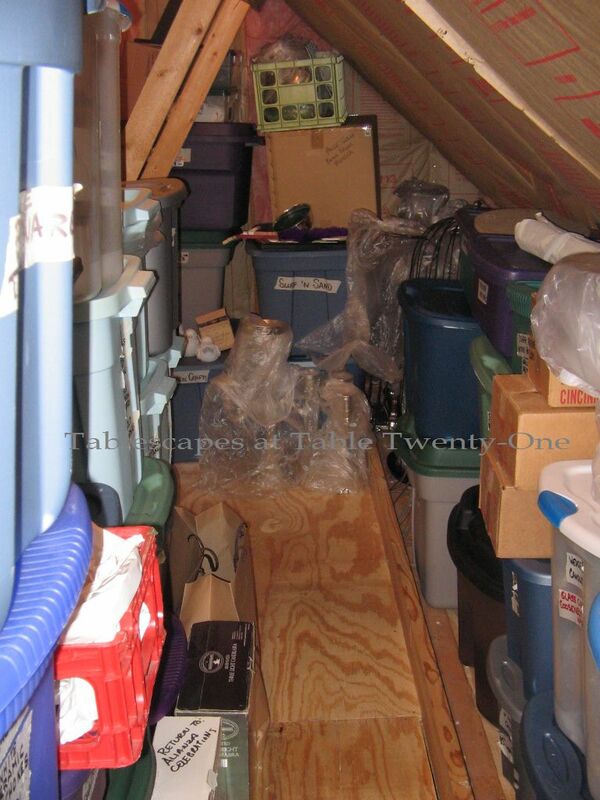 There’s just no way to photograph the entire storage area in a single photo, so Sheri did the best she could. We still didn’t get a photo of the 40+ Rubbermaid tubs stacked ceiling high on the east wall in this room. My husband and I put in pegboards that work pretty well for a lot of things. 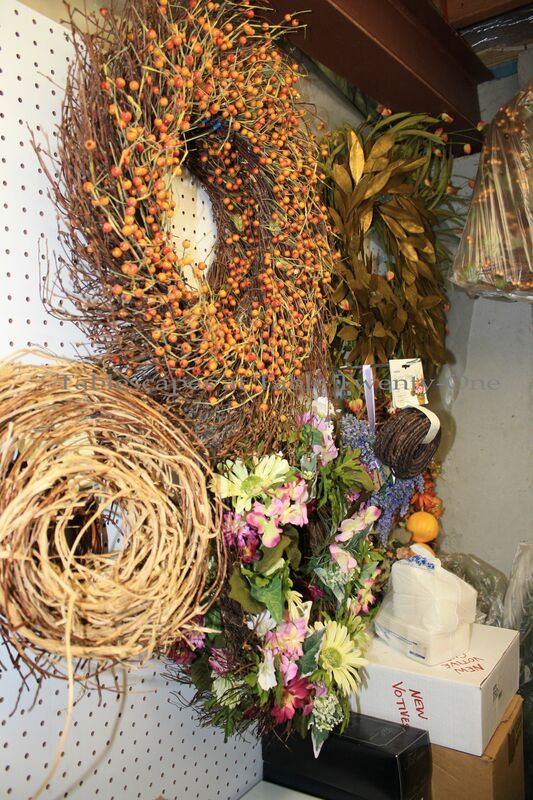 More wreaths are stored on hooks in the sump pump room. 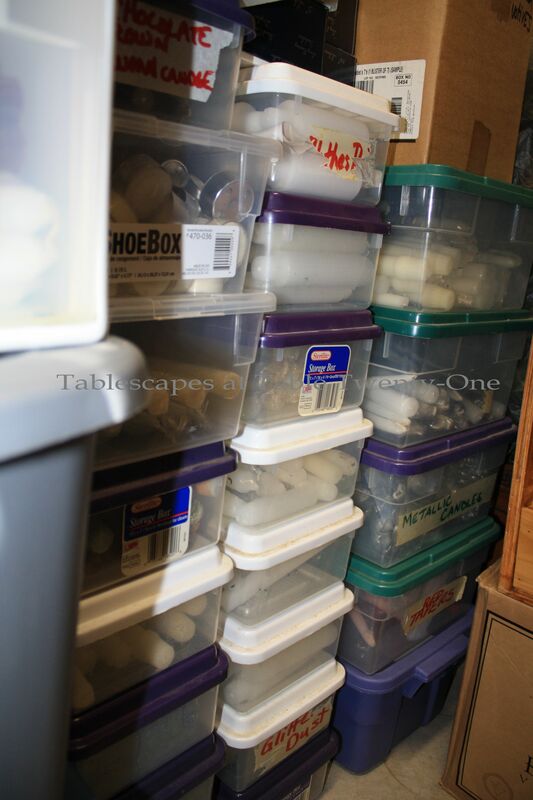 Smaller see-through storage containers hold little stuff that can get away from me in a hurry if I’m not careful. 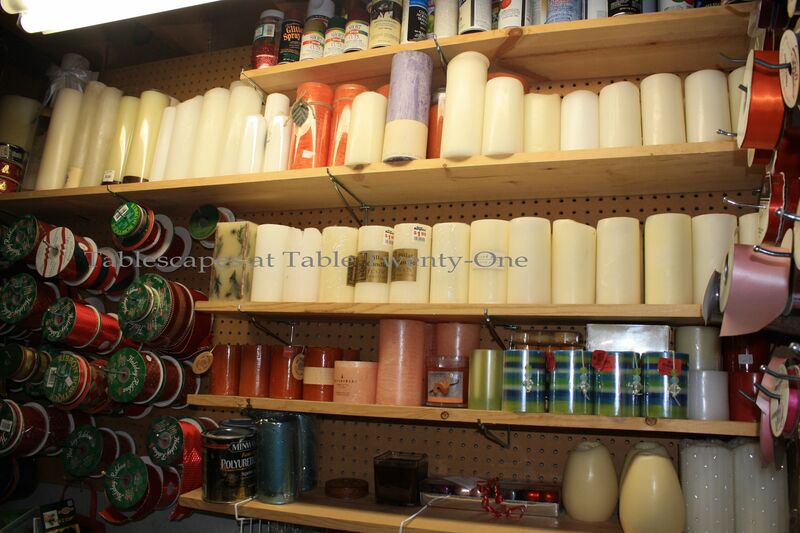 Did I mention that I have a LOT of candles (LED and natural wax)…and ribbon??? Most of the ribbon hangs here, but there is additional curling ribbon in a Rubbermaid box that couldn’t fit on the wall. I love these stackable drawers! I have several of these in the storage room filled with about half of the 45 different kinds of votive holders I have collected over the years. I usually buy votive holders in quantities of at least 12 per, but I have basic ones that come in quantities of 50-75+. I’m getting claustrophobic! Let’s get out of this room and move into the downstairs living space. 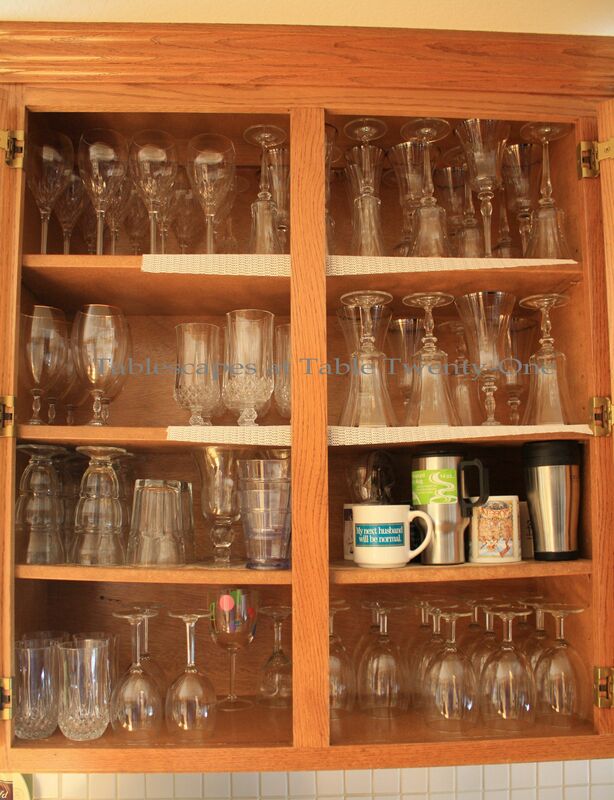 This case is filled with all my dishes and stemware with Mexican flair. 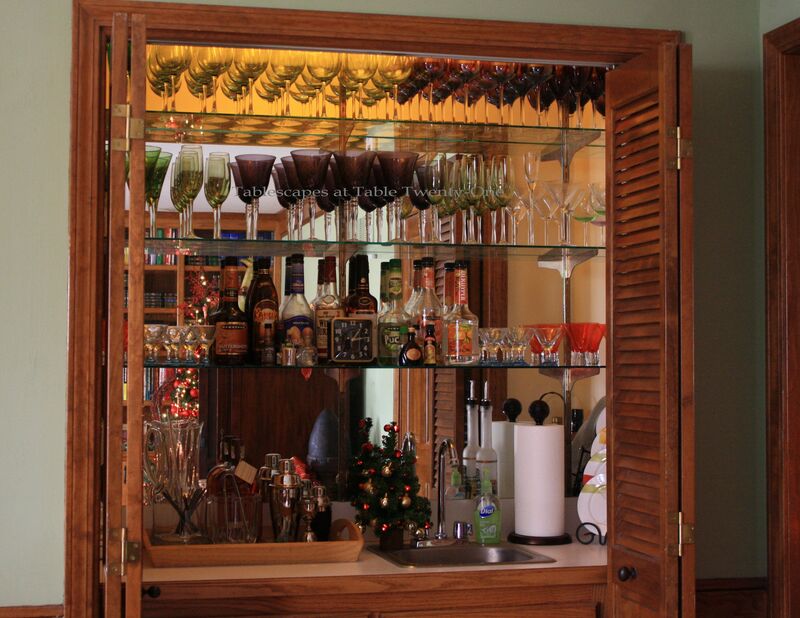 The downstairs bar area has 9 cabinets and multiple drawers, all filled with dishes (mostly melamine), stemware, casual flatware, and serving bowls & platters. 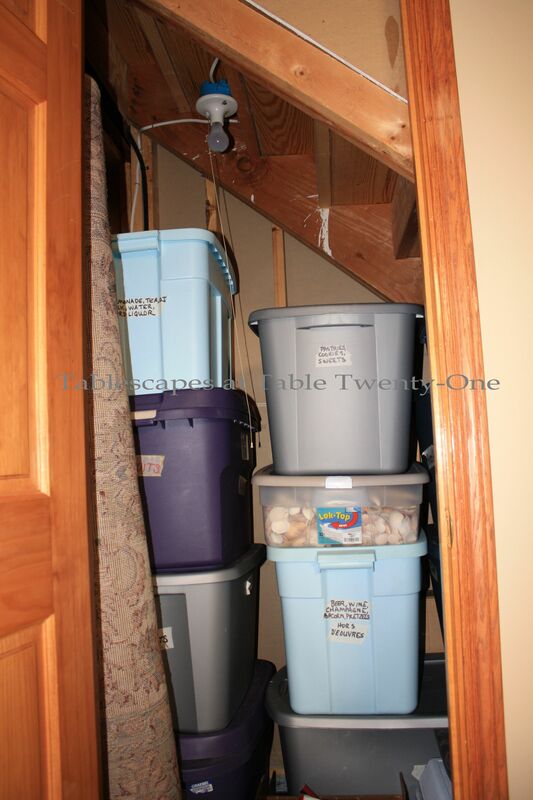 Two closets on the lower level, including the sump pump closet, store Rubbermaid boxes of decorative supplies. OK….let’s make that long trek up to the top floor! 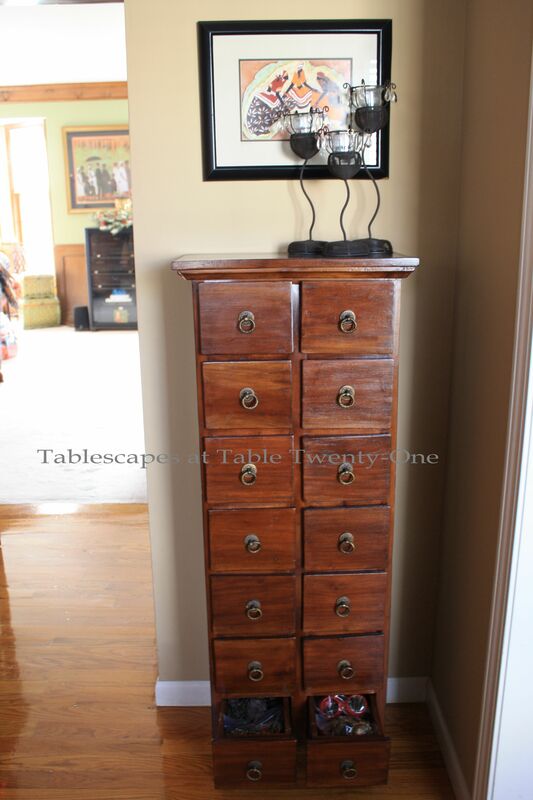 Another apothecary chest in the hallway on the top level of the house stores more napkin rings and place card holders. I corral the napkin rings in Ziploc bags to keep them from getting all jumbled. 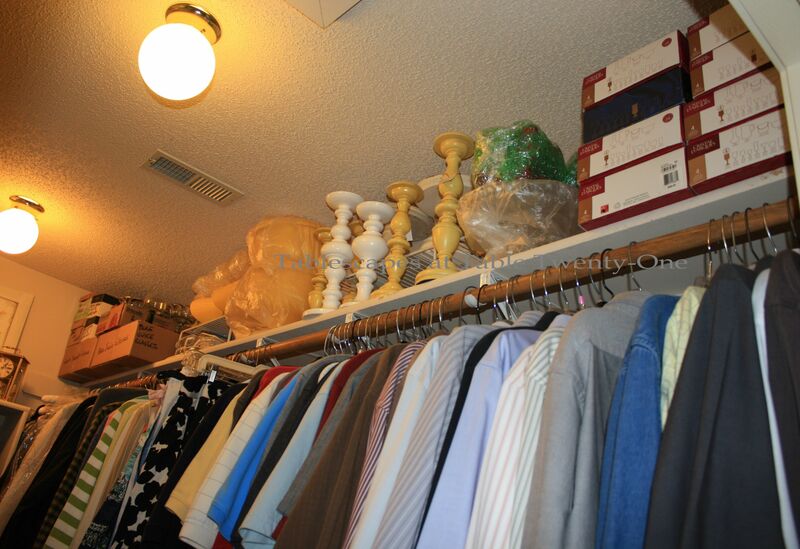 Several otherwise unused closets in the house, like this one in the guest bedroom, are great for storage. 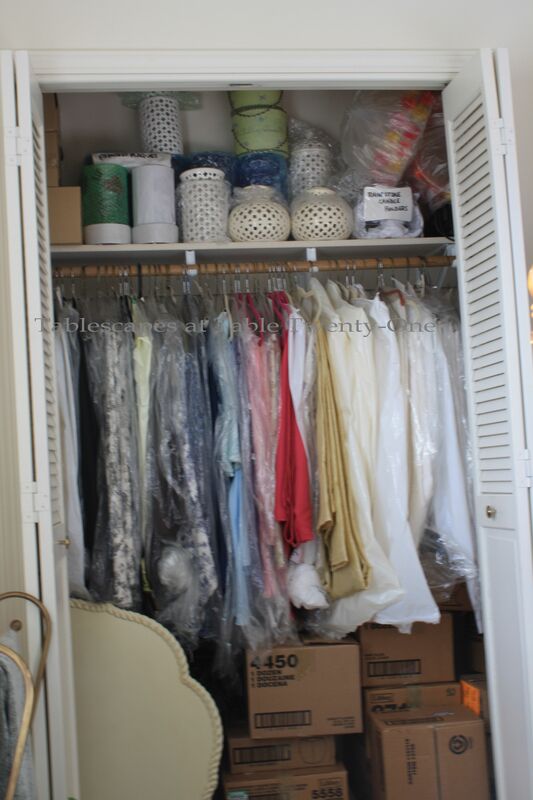 I currently have about 150 linens, many of which are tagged, bagged, and hung in this closet according to color. 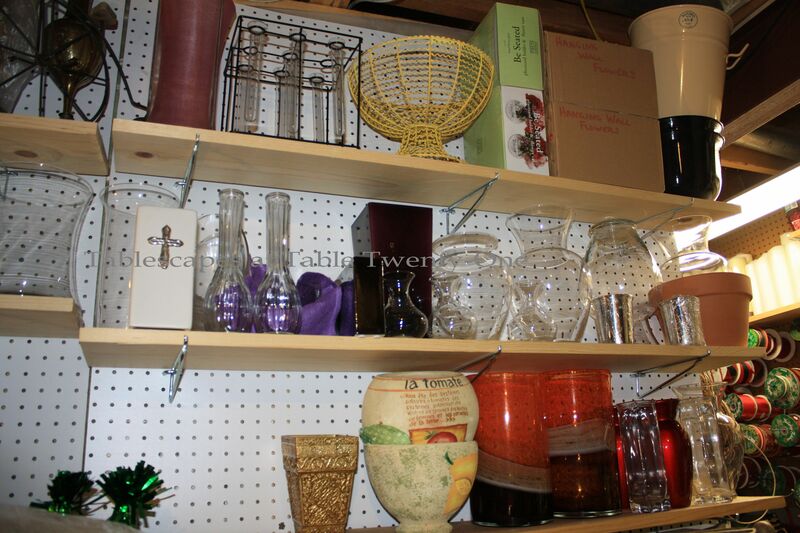 The shelves and floor are used to store various tabletop accessories, an actual tabletop, and boxed stemware. 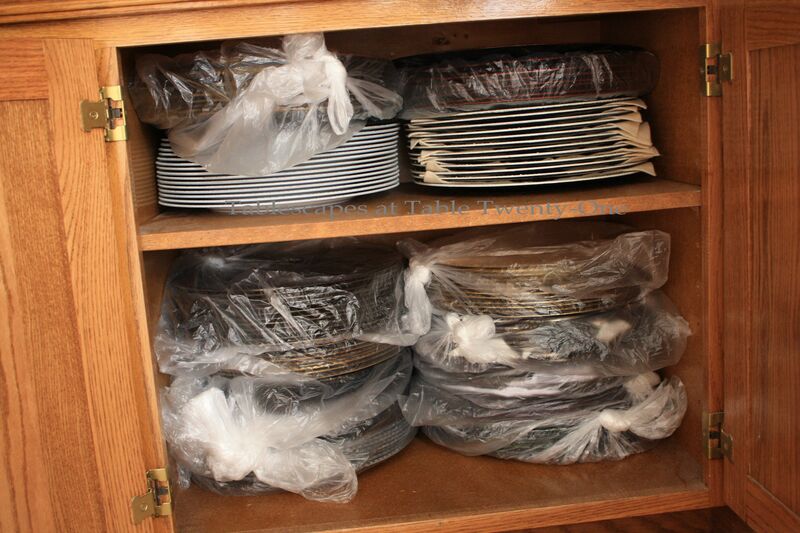 Another case filled with dishes. And, of course, the obligatory underbed storage (under every bed!) for more linens, napkins and 56 sets of placemats. Wait! I’ve changed my mind!!! Are you sure you want to come in here??? I don’t know…it’s pretty crazy!!! Well, OK…here we go! Don’t say I didn’t warn you!!! This is where I do floral arranging with faux flowers for some of my posts when my money’s so funny it has its own sitcom. 😉 I couldn’t get a shot of the area where I arrange the flowers, but the faux florals are mostly stored in here along with lots of silver candelabra and floral vessels like the one Linda of A Toile Tale won back in October. Oh…did I mention I’ll be giving another one of those away soon? Stay tuned! 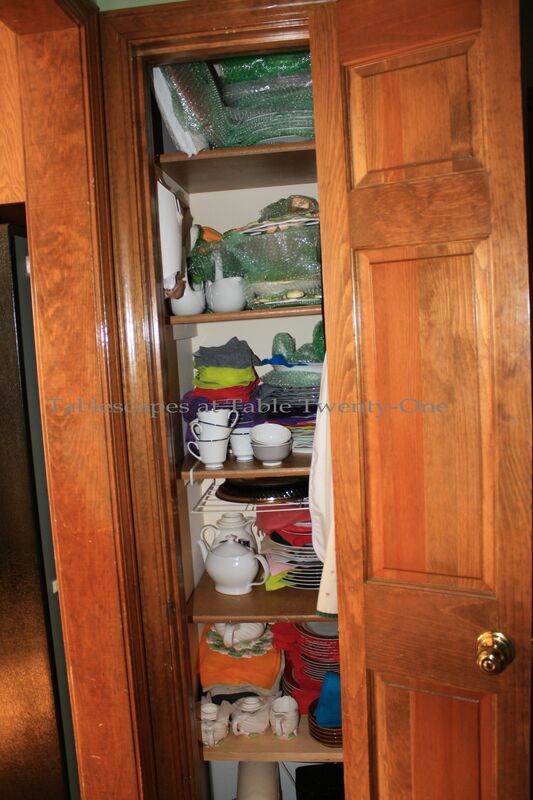 The clothes closet in the master suite is a great place for storing stuff including stackable drawers of cloth napkins. My husband reinforced the brackets for the overhead storage on both sides to prevent an avalanche. Now let’s enter another crudely built little storage closet we had built into empty attic space a few years ago. The sign says it all! This room stores many of the things I would have a COW over if they were to get broken. 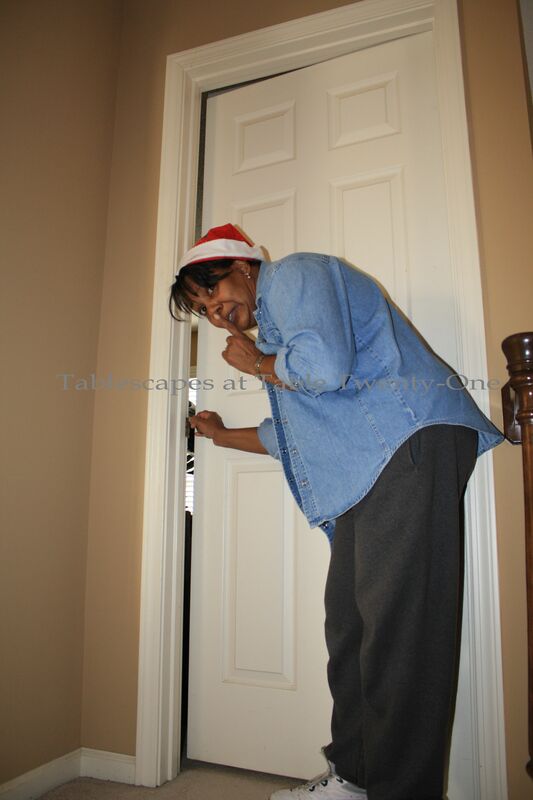 I know it looks a little messy in this photo (I was in the midst of Christmas decorating, remember! ), but believe me…it is incredibly well-organized!!! 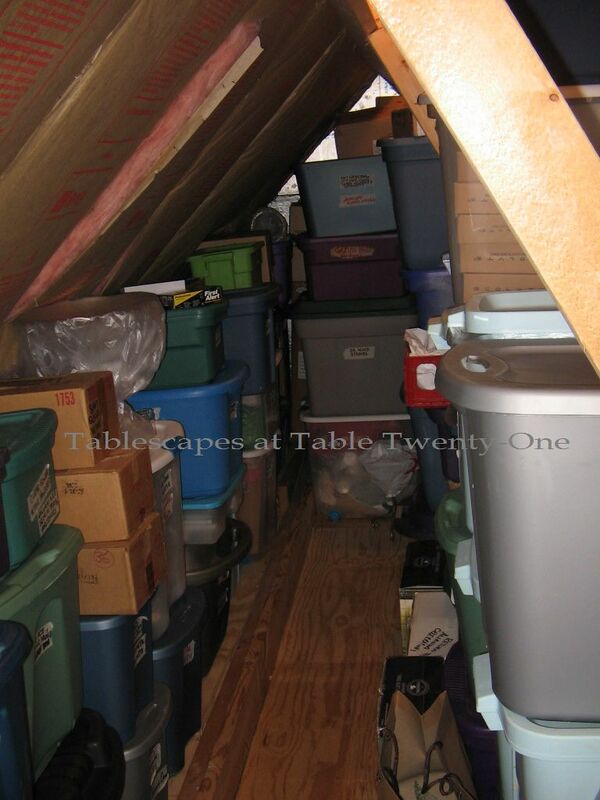 Most boxes are stored two deep and as high as the pitched ceiling will allow. 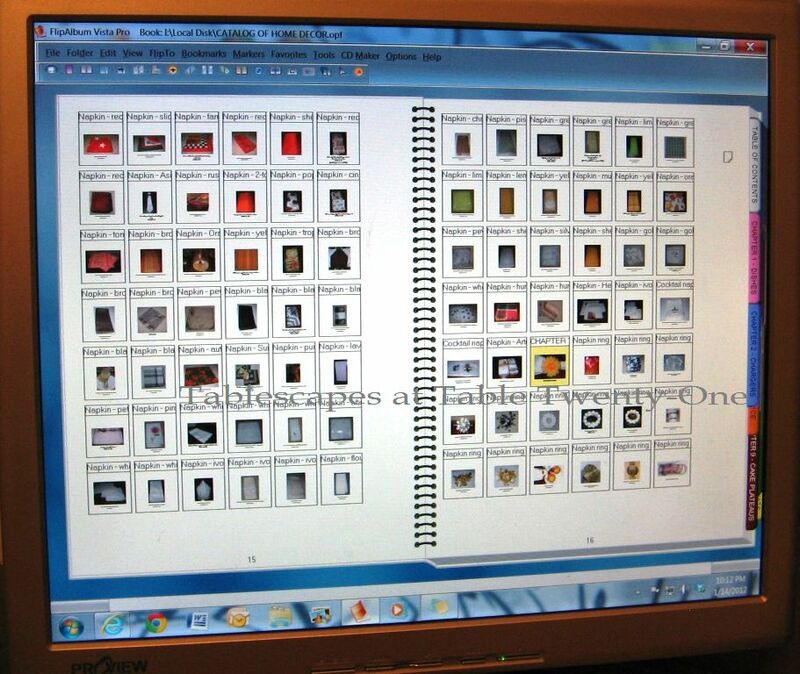 FlipAlbum is a customizable computer catalog that looks and works just like a real book! I use the Vista Pro edition (currently selling online for $159.95), but there is a free version, as well. It took me awhile to initially set it up with everything I had, but now I easily maintain it by simply making entries each time I return from shopping! I’m up to 2269 pages…and counting!!! You can create pages within the chapters with as many or as few photos as you like! I photograph things as I bring them home and add a brief description along with the quantity in stock as well as, when necessary, dimensions. So….if your eyeballs haven’t popped completely out of your head by now, that’s my pitiful little story! What’s yours? Don’t forget to join the arguably much more sane tablescapers and me for this week’s Tablescape Thursday! I got nuthin. I’m flabbergasted! oh my goodness! I am both horrified & impressed at the same time. Just the sheer magnitude of stuff you have is overwhelming!! You are a super woman & genius to keep it all organized though. Just beautiful. You did a great job of organizing everything. I am impressed that you are not on meds for that OCD. All the labels and crates and areas. I am overwhelmed. But on the other hand, if they cured the OCD you would be on A&E hoarders for real. I am extremely impressed & envious of your organizational skills, Alycia. Everything is labeled so clearly & stacked neatly and that computer program….well, let’s just say I have a lot to learn. Honey, this post was soooo enlightening. BRAVO to You! If it makes you happy & you certainly USE your stuff, who cares what anybody else thinks. GO FOR IT!! You only live once…heck, this could all be shoes, ya’ know. I will be showing this to my husband to get him off my back. Even more than your collections, I am utterly impressed with your organization of it all!!! I must say you have a heck of a lot more than me!! I am impressed with how organized it all is. That’s a lot of work to put together. The Flip Album is quite awesome! Everything is so well taken care of and organized. You do think big no doubt! I know this comes from your previous business and I’m sure it multiplies the amount that most of us would normally have….I buy two candlesticks, you buy 8!! You have a lot of family and large get togethers so I can understand your large assortment. Give Ramon my phone number anytime he thinks he needs help!! I love this post Alycia! You are so organized. Marvelous! Such an outstanding collection for tablescaping…and to think that it is all catalogued and readily accessible…you’re a fine example for all dishaholics! I’m exhausted just looking at this! Great job Lee Lee! Picture this…child with hands and face pressed to screen in wide eyed wonderment whispering “Wooooow!” I am impressed on a number of levels!! Alycia, as soon as I pick my chin up off of the desk…Iol…WOWWWWWWWW! Just when I was about to ask how you keep up with all of these items, I continued to scroll down and there was my answer!! You have got to be the MOST organized person on the planet!! This just left me speechless…and that’s hard to do!!! LOL!!!!! Superwoman, PLEASE Stop the Insanity. Us mere mortals are being all we can be! you weren’t kidding!!! 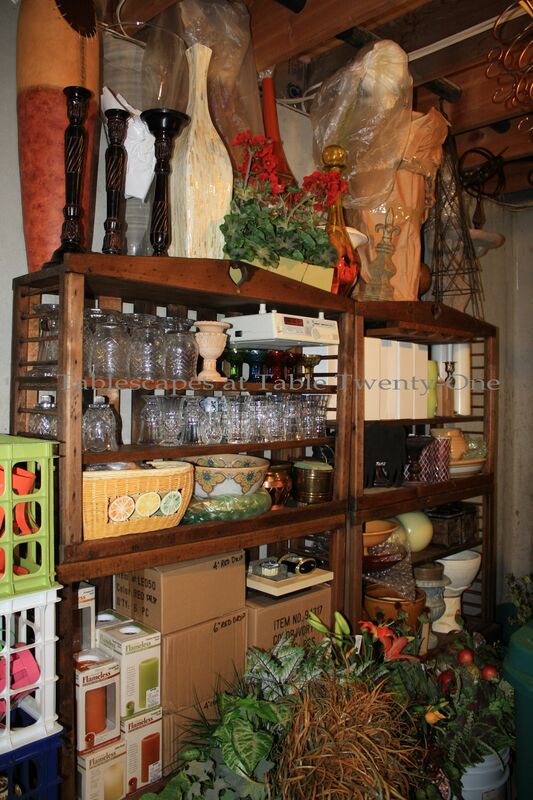 Love all the great ideas you just gave me to better organize my “little tiny” collection…. I think you’re my hero…Can I come borrow the stemware on page 448 and the dishes from page 1,256. I am so impressed that you have it all on the computer. Thanks for sharing all of you storage ideas. OMG, you’re the most impressive organizer I know…it’s all so amazing. OMG! You are definitely a dishaholic….Big time, did I say it? I don’t feel as bad now about my own dishwares. My husband has made a few comments here and there. I know they must think we are crazy….It’s kind of like shoes…Men only need a few pairs of shoes, however women need and WANT all different styles, colors, etc. This is AWESOME! 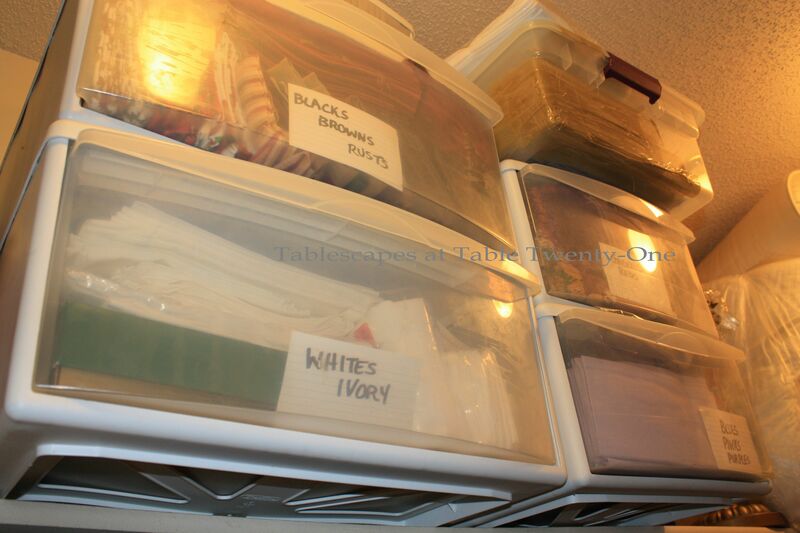 I so LOVE to see how fellow dishaholics organize their stuff. You have definately invaded more general house space than me, but I do have to share mine with 4 other people. I really love that computer inventory system. Thanks so much for emailing me about it. It’s so neat to see it in a post. It really gives me an idea of how it works. I think I can truly see purchasing this in the future. But I shutter at the thought of photographing my inventory. You have a TON of stuff. You make me feel soooo much better. Thanks for sharing! You are a women after my own heart. I have alot of stuff for my tablecape. You have showed me how to organize it. LOVE YOU LOVE YOU LOVE YOU. I am just floored by your ability to organize and store such a WONDERFUL stash! Thank you so much for sharing! This trip to Dishtopia has been amazing and funny, you had me laughing out loud! This is crazy girl!! I am really shocked! I always imagined you would have a fantastic collection but this is unreal! And it’s all so organised – I’m so envious!! Alright, alright! I’ll let everyone else go on and on about the magnitude of your stuff and your enviable organization skills. Enuf said. 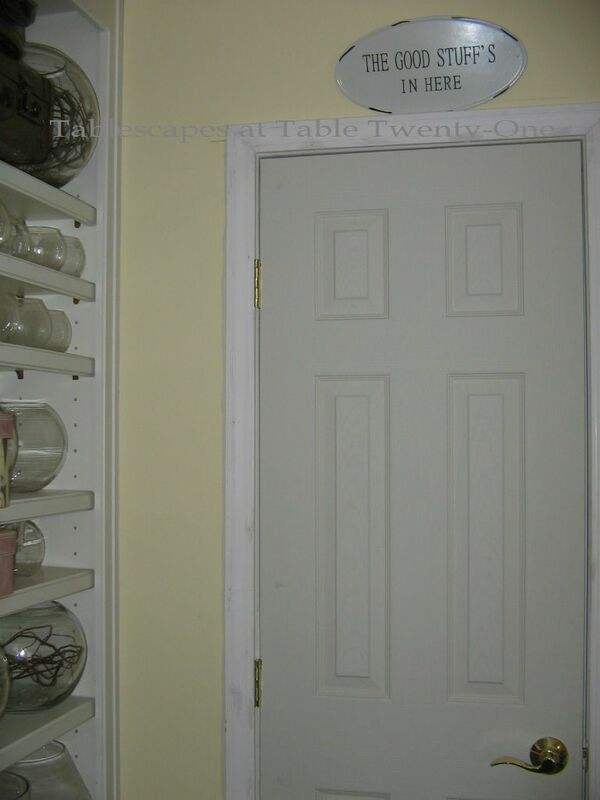 BUT….if I were you, I would for SURE stop bragging about having a husband who reinforces shelves for you. For God’s sake, woman!!! If you think that all of the bloggers envy your dishes, can’t you GET that they are bright green over your husband? AND you post cute pictures of him! That is going to get you in trouble, girl. I fear women planning to seduce or even kidnap him. There is no doubt in my mind that you need to hire security!!! PS Thanks for the sweet shout-out! Wow you have a lot of dishes !!! I have 1/8 of your collection !!! You must also have a big house for all your dishes?? I hope you and your family have a wonderful week sweet lady. WOW ! I’m speechless ! You certainly are organized. Thank goodness ! I just posted a similar post! Hi, my name is Delores and I’m a dishaholic! THANK YOU, THANK YOU, THANK YOU!!!! !…..for taking the time to do this…..for sharing all the wonderful pictures and organizing tips..
and for doing it in such a fun and entertaining way! Hope you never get tired of doing this, because I will NEVER get tired of reading your awesome blog entries…..I actually look forward to them….they brighten my day! You win! The crew from Hoarders will be there shortly! I ditto Retta’s sentiments! Totally Amazing! My dh would throw all mine out if he could. But then he would be homeless! Start burning those candles girl, we don’t have THAT long. Burn baby, burn! Hi. My name is Kathe and I am a dishoholic! I showed your post DH. He thinks my addiction is bad but now sees it could be worse! I also corral my napkin rings in zip locks. Almost all of the basement storage space is for my table stuff. DH gets a small corner to store his home beer brewing supplies. I will sleep well tonight knowing I have found my long lost hoarder sister! OMG!! I am going to show this to my husband…he complains about MY paltry collection (though we do have a small house). You are so organized and I’ll be you can put your hand on anything that you might want at any given moment! Your husband is an angel too! Your “stash” is a delight to behold! I think I’m drooling —-and so organized…..maybe when I retire that will happen. I really like your electronic organization in the FlipAlbum. I am hoping to get some kind of “log” going this year so it’s good to know about this software. I don’t feel guilty about my fabric stash now. I am glad that you mentioned having a husband, because I was sure you didn’t. 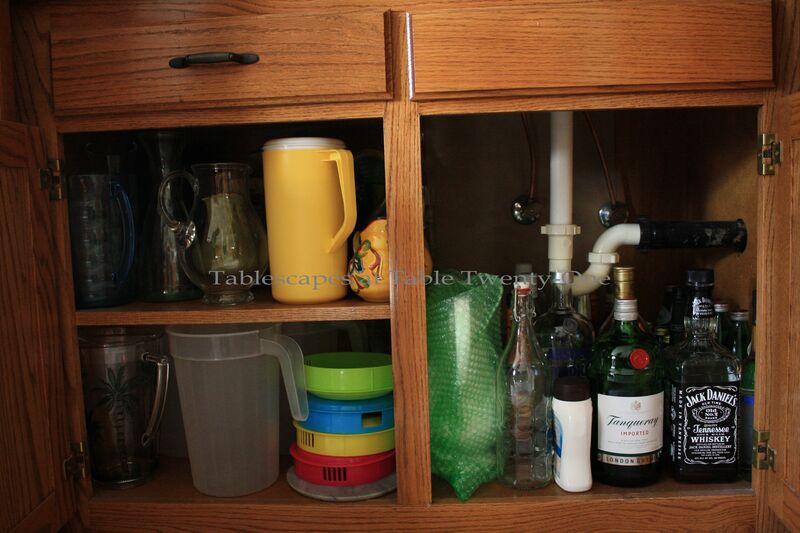 With liquor on the bottom of the cabinet, I guess there are no children in the house. While I understand the collections, it makes me question my own over abundance of fabric and what it could mean to someone else who could use the fabric or a project made from it. I also am thinking about all the money that I have spent that could have blessed someone else. Thanks for letting us tour your organized home. I would love to be as organized with my sewing obsession. OK>>>>>>>>>>>>>>>>WOW, that’s all I can say!!!!!! Girl, you do have stuff, more than I could ever imagine. With all of that you can do tablescapes forever and lend the rest of us stuff to work with as well. Like you, I am a dishaholic, but storage space is holding me back. 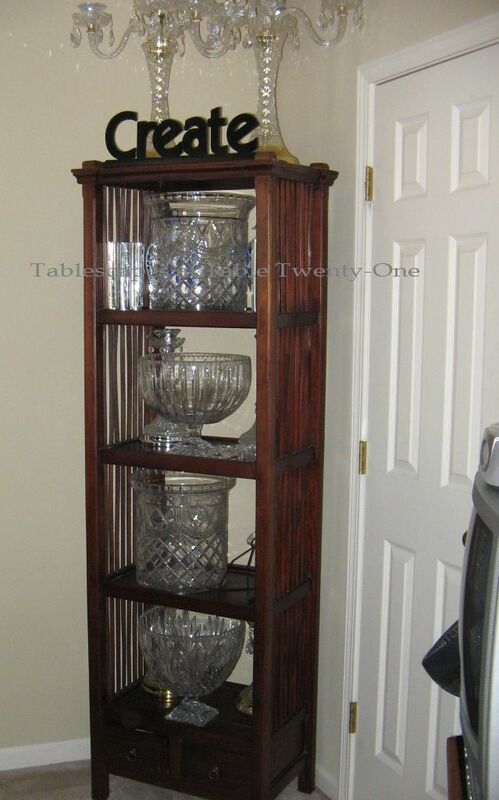 I have 2 houses completely stuffed with dishes and glasses but nothing like I see here. Surely, you didn’t move all of it. That would have been not once but twice. I’m going to have to go back through this again to take it all in. You are a hoot, Alycia! I enjoyed this very much! WOW! Thanks for sharing and for some storage ideas. I’m having trouble organizing my dishes and accessories. The Good Stuff’s In Here! I concur with the others… I’m speechless and impressed. I’ve got a whole lot of catching up to do! Holy Cow you have got some stuff! You are so organized I can’t even believe it….wow. What a fun place to come for dinner!! I think you could invite everyone of us from Tablescape Thursday…we will bring the food 🙂 Thank you for sharing. I have a big project this summer, guess I better save my duckies to purchase some cabinets or try my hand at building. Thanks for some unique ways to store, and the storage binder info will get started soon. Want to help? PS I do have in my possesion a label maker. i always enjoy reading your blog. today i am stunned by the magnitude of your collections and organizational skills! from reading your posts i would say you are devoted to church and family. you use your not insignificant gifts to further those relationships with grace and style. bravo!! and if it includes a little shopping along the way…even better!! love the post! 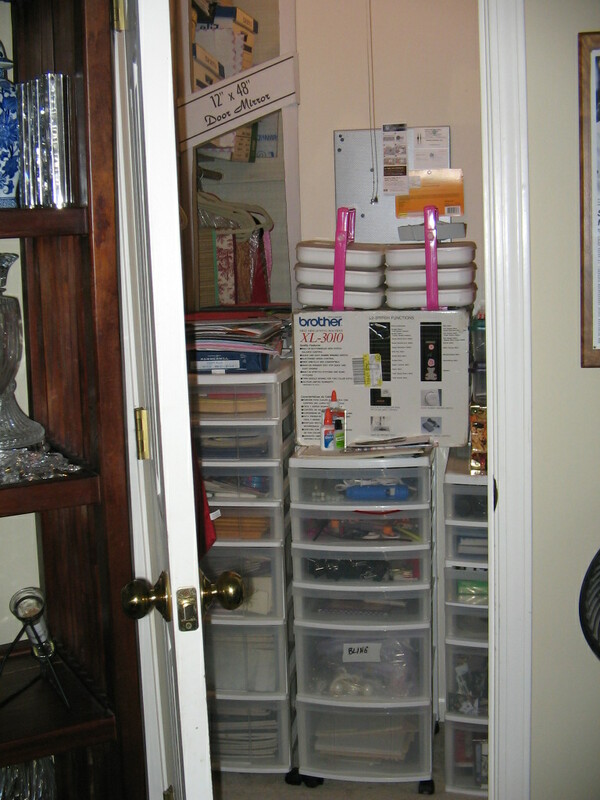 I love it all – your stuff, your gift of organization, your storage units, etc. My husband tells people that if a tornado ever hit our town, most people would be beheaded by my dishes flying through the air! He loves them and every time I get more, he starts visualizing where he’s going to build me another shelving unit! And it’s a cheaper love than buying diamonds and furs!!!! Thanks so much for sharing with us! Alycia, you are a hoot and a half! Loved seeing YOU and all your stuff! Thanks for showing us! You do have QUITE a collection, and I’m totally impressed with your organization system. It appeals to my love of all things spreadsheet! Tell your husband he must be the world’s most patient and understanding man in the world! I can’t add anything that has not already been said except, I would like to invite you over to the gardedweb.com . We hang out at Holidays and you would fit right in. Oh my goodness! Holy smoke, I feel so much better! 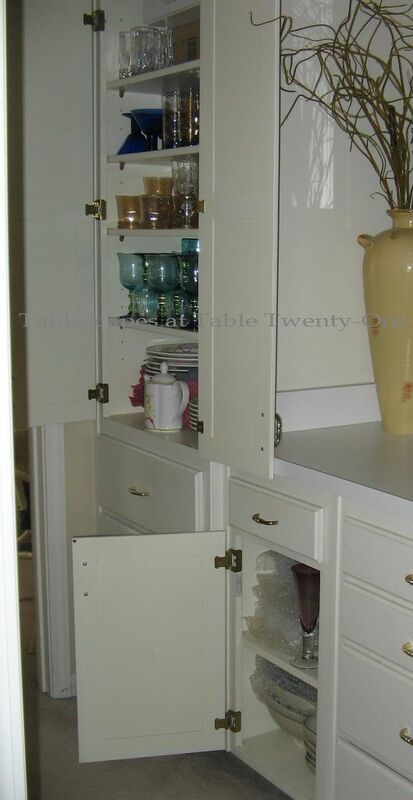 lol Just the flatware drawers alone make me feel better. You’ve got quite the collection, so enjoy it! Amazing collection and organization. I can’t even imagine keeping up with all of it, yet alone using it! What a business you must have had!!! I started bagging and tagging my linen just this year, according to color and table size so I dont spend so much time figuring which sized table the cloth will fit. Looooovvve your organization. Girl you are too funny! My goodness you ain’t kidding with the dishes. You are very organized though which is nice. Have a great weekend. Oh my..you do love dishes!! !..Your collection is beyond amazing!. You’re joking, right???????? That’s not your real house, it’s a television studio……where’s the cameras and crew? You been hanging around Martha’s studio again, haven’t you!!! Amazing! Wow! You have so much stuff and it is all so organized. That is so impressive. You left a lovely comment on our blog and so I thought I would come over and visit yours and I am blown away by your collection. One of my SILs had a similarly large craft collection, but hers was not very organized so it overtook her house. I think your system is the key to making it manageable. Thanks so much for sharing. I’m inspired to organize my table setting collection a bit more now. WOW!!! !I’m not off my rocker, after all..just need more space. 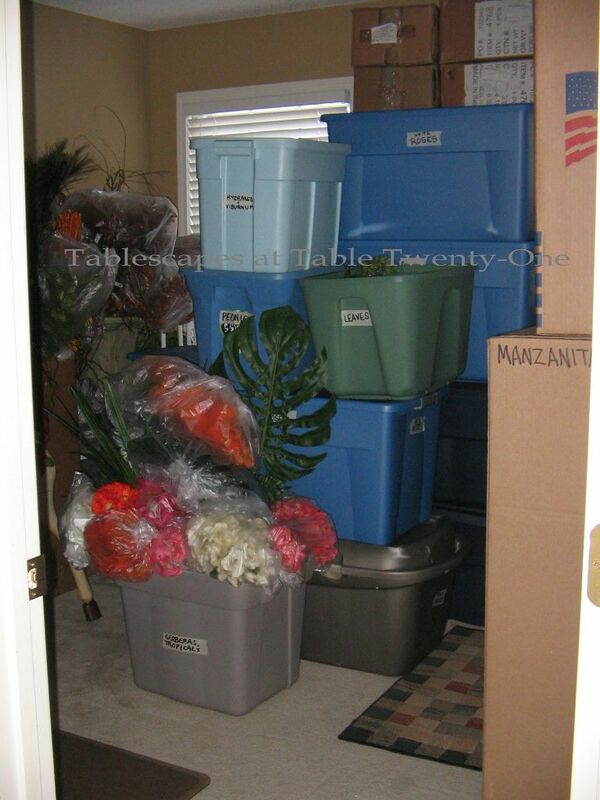 My husband always jokingly says “take a little trip for a few days and when you return, there will be so much more space here.” I use to do weddings and other special events for my church and friends, so lots of stuff has accumulated in basement, garage and guest bedroom, but needs better organization. 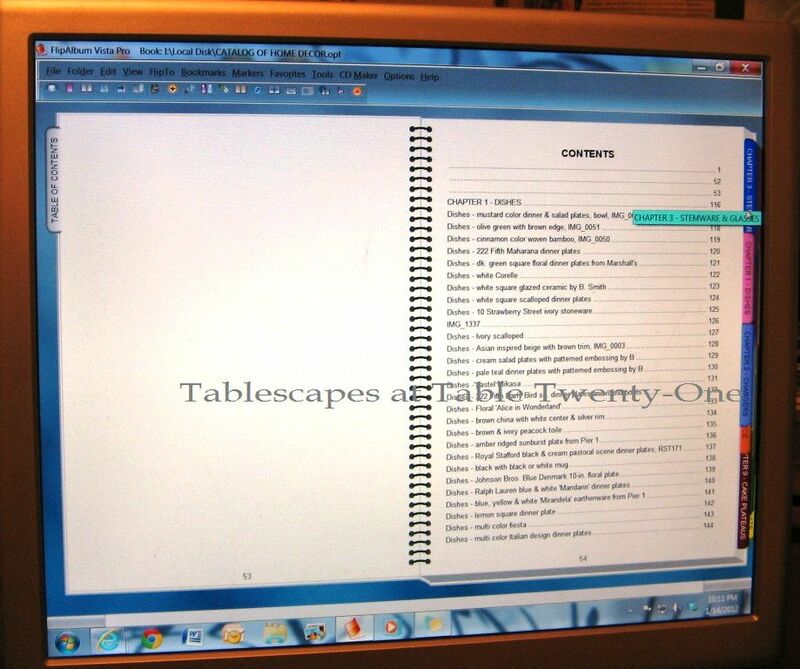 Discovered the world of tablescapers by accident! Now addicted!! LOVE YOUR SITE!!! Will one day be brave enough to post and ask for feedback…until then will continue to “lurk”. Thanks & Best Wishes to all who post. My mother just showed me your blog as evidence that she is not alone in her addiction and tablescape OCD. 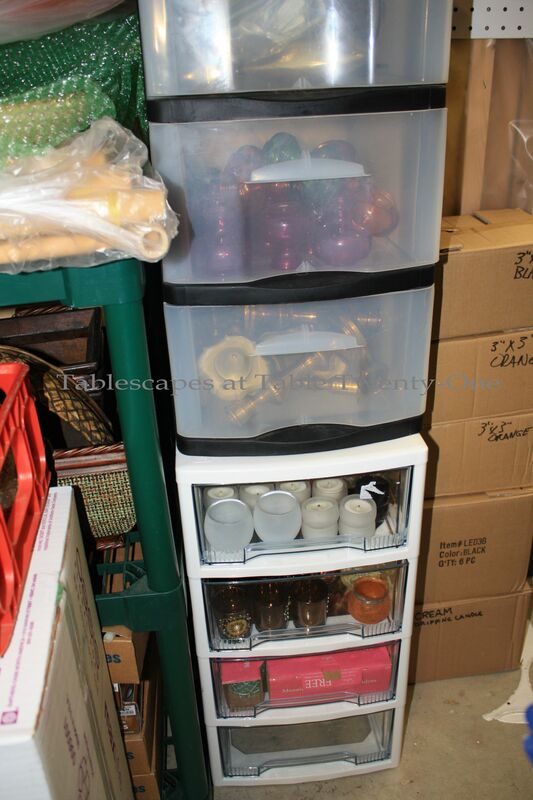 She has over 200 sets of dishes, 155 tablecloths, along with all of the assorted serving bowls, napkin rings, etc. etc. etc….. She manages to have everything organized by color, theme, etc. but now she wants me to help make a book! She keeps reminding me that “someday this will be all mine” and I keeping thinking about how I would rather burn down the house than deal with it all. As I was typing this, Mom walked in with three new sets of dishes and a new platter. I am tickled that Mom has found someone as organized about all of this madness as she and hope she will be able to continue the hobby she loves, as long as I don’t ever inherit it. Wow! I’m stunned! I don’t know quite what to say! As I was going through the posts I started thinking, “How does she know what she had?” But hey you got that covered too! My dishes are a drop in the bucket compared to yours and I sometimes have a hard time storing them but now I’m really inspired! Way to go! I’m so impressed! Awesome! 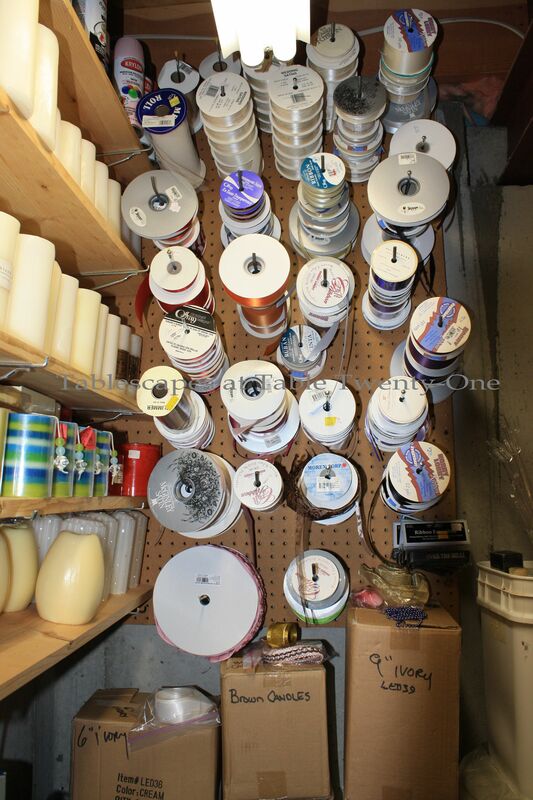 I am so envious!….but then I just have to say even organized all of that “stuff” makes me tired. I do have to say I will never feel guilty about my many sets of dishes, linens, etc again. That software for organizing is really wonderful. I can on ly say thanks for posting this I enjoyed every minute I spent here. I’ll be back. Just visiting and realizing that I missed this post! You have alot of stuff but manage to organize it perfectly! I am impressed! Now I understand how you can creat such beautiful posts! If I owned all that you have to choose from I could too. You are an amazing woman and I thank God for you everyday. I am learning so much from you…I thank you…..You bring out my creative side! I truly get motivated reading your posts. You are one in a million. I want to meet you in person one day! We could have a blast! I don’t know what to say – but you are amazing! I want to see more of what you do. I will be back! 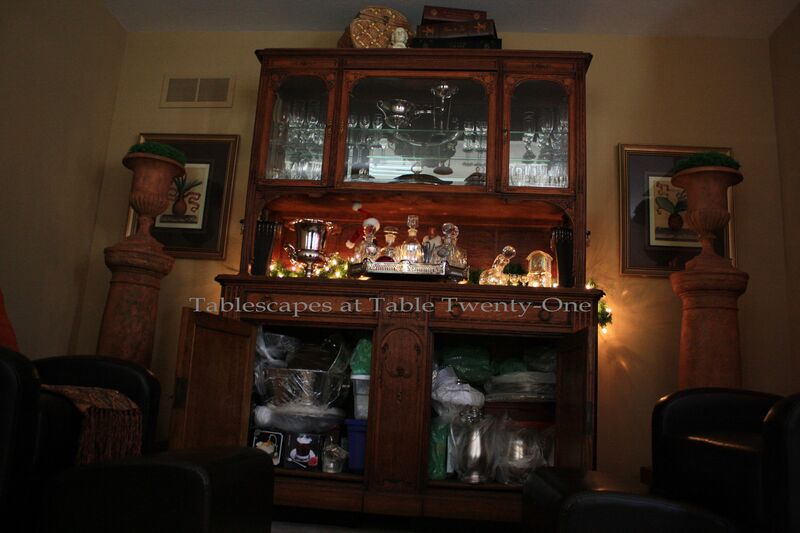 I decorate our home and dinner parties just for personal pleasure; but, I’m a professional organizer by career. AND I’M FASCINATED WITH YOUR ORGANIZING!! I’ll have to check out that FlipAlbum. You’ve now answered one of the two questions I’ve been wanting to ask. 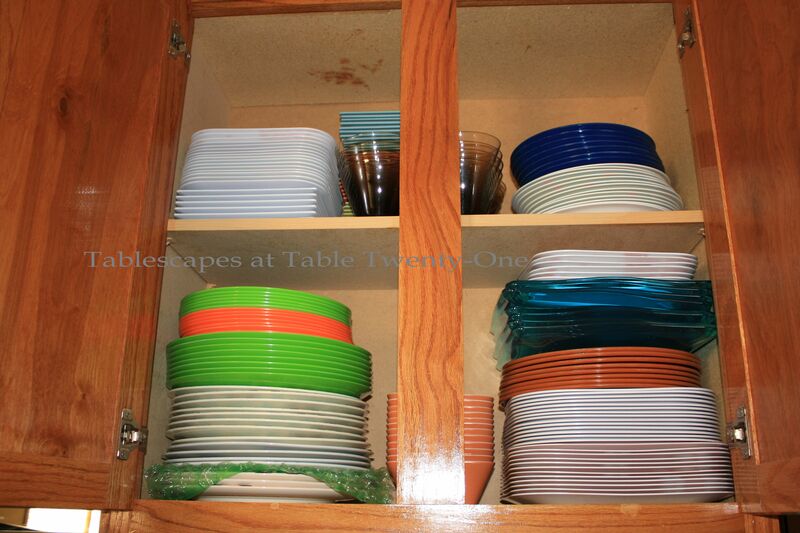 The other is this: when you find pretty dishes, do you have a “standard” amount you buy? You mentioned “12” in this post, but the catalog page you photographed says “6.” Does the number depend on price? 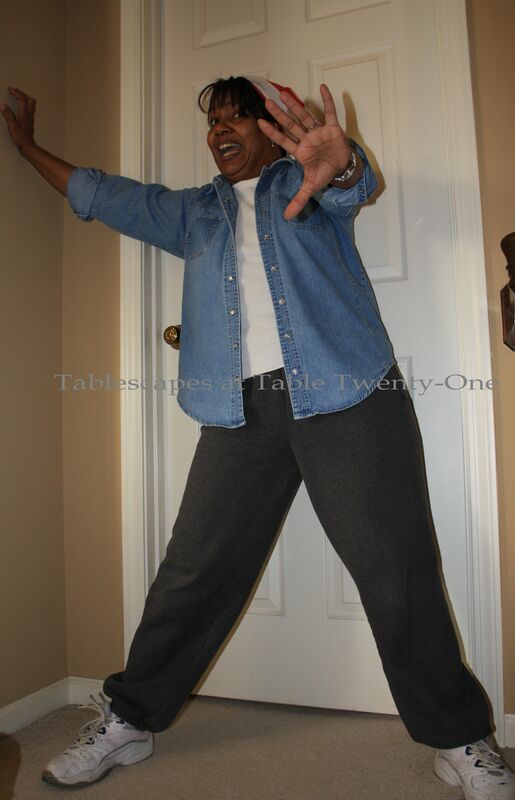 Style? Versatility? We usually invite no more than two other couples over at a time; I like the conversation dynamics with that number. So, I guess that would be MY standard quantity. What are your thoughts? WOW. Organized stuff! What a concept. This is why you are the tablescape guru and my table is piled with stuff I’m afraid to put away for fear of never finding it again. Love it. I am COMPLETELY overwhelmed by the sheer amount of stuff you have, Alycia. I thought I had a good feel for it, knowing about “your past”…(doesn’t that sound mysterious?? ), and seeing the multiples of things on your tables that I’ve always admired, but was I in for a shock! Not surprising at all, though, that it’s so well organized, AND catalogued. I’ve often wondered about a cataloguing/inventory system, if nothing else for insurance purposes. Like Rett, I CAN’T WAIT to show this to my husband–you’ve done a lot of us in Blogland a huge favor :). You are a complete riot with your pictures and daring ways! 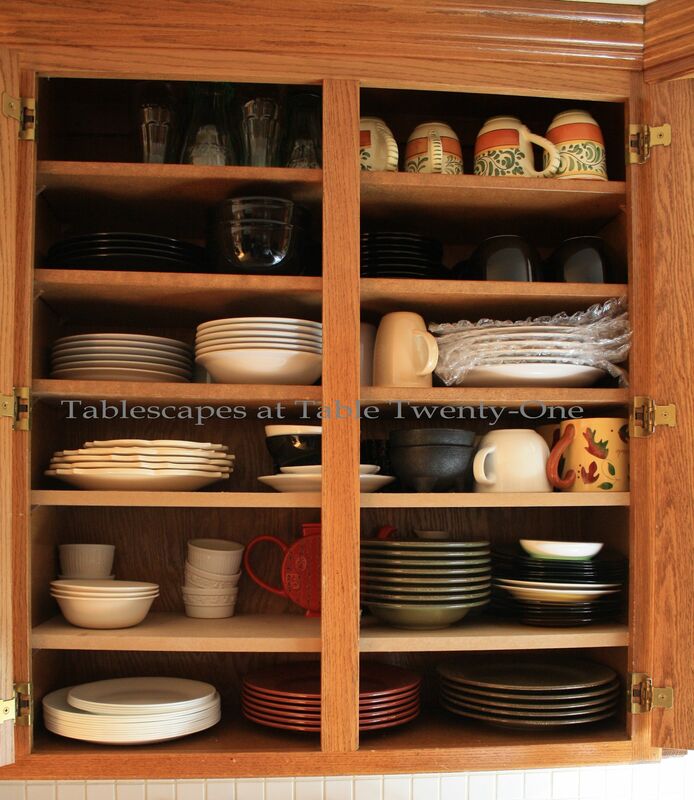 I’m impressed you are so organized with all your dishes and know where everything is stored. Was that a Brother machine I saw hiding in there. 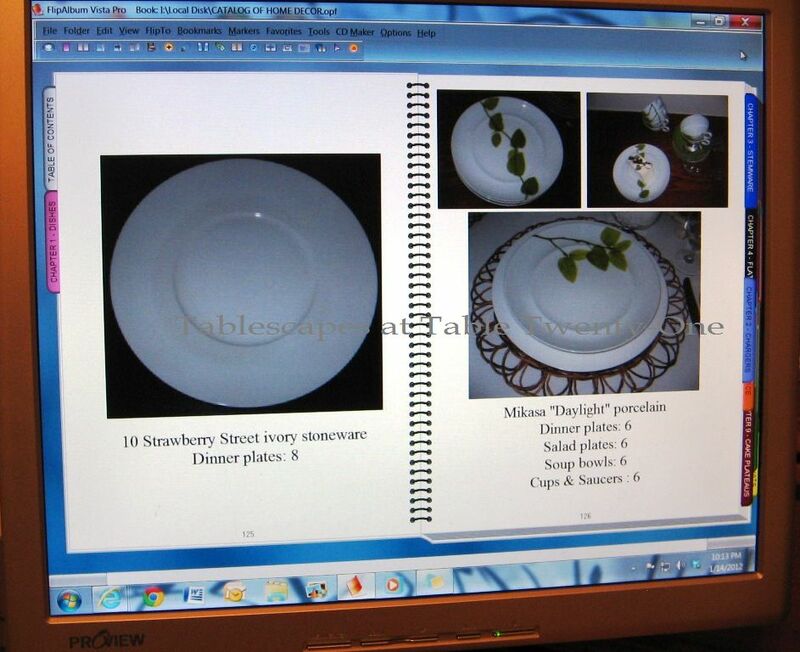 How about I trade you some sewing lessons for some tablescaping lessons? I am so relate to your madness. Seems like I constantly work on my organization of my stuff but I seem to keep adding to it. I am very interested in the computer program you are using for your Flip Pages. You would think I would have a program to categorize my stuff but I don’t so I’ll put that on my list of organizational things to do. I think I just short circuited my laptop from drooling! 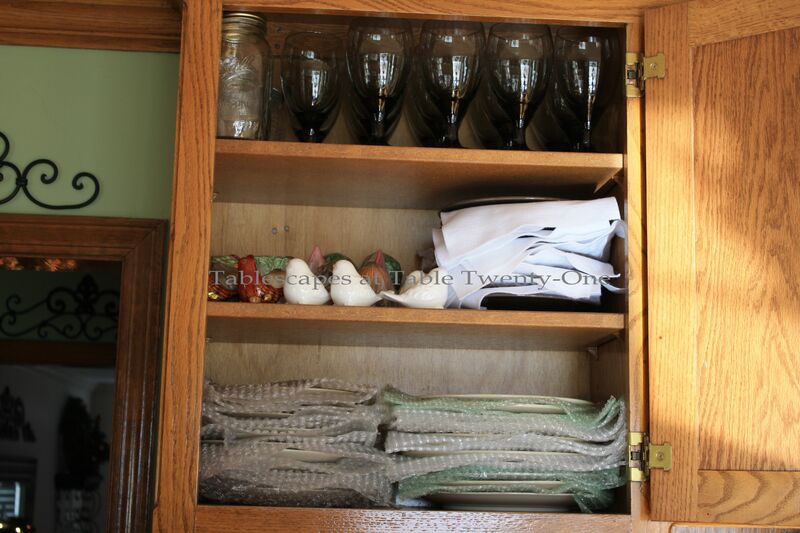 I’m so in love with your organization skills and all those toys….uhhh I mean dishes, candles, flatware and linens! I’m dizzy just thinking about two things – how much “stuff” you have and how organized you are. 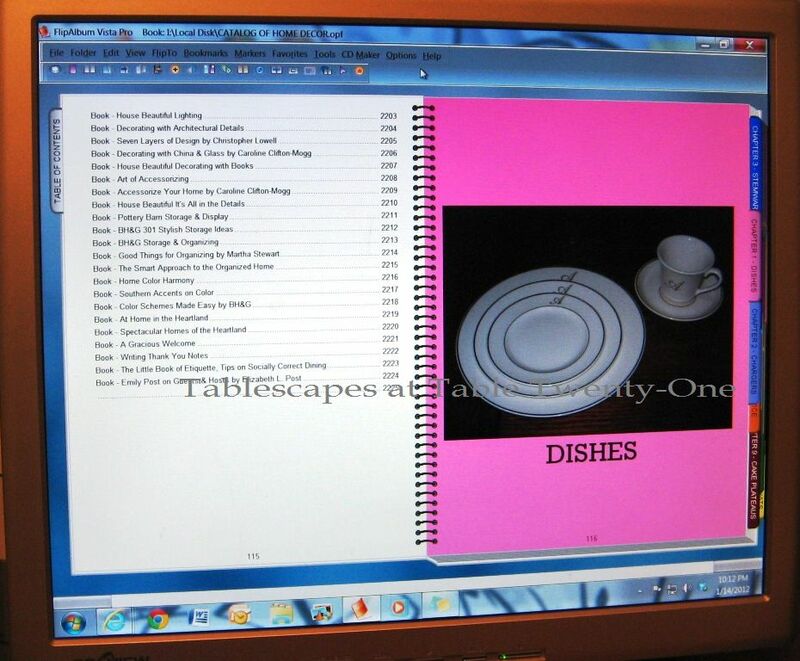 You are such a generous person to share all you know about tablescaping and related topics. Thank you for all that you do, Ann O.
Alycia, who knew? You have soooo many skills and talents and they marry so well. Based on what you do, I understand that be organized is a must, but my dear you take it to another level. I’m curious if you’ve also been asked to join a professional organizing team? You definitely have the know-how. You are amazing in every way! I love how you’ve utilized your home furnishings as storage to incorporate your beautiful inventory – no one would ever know. 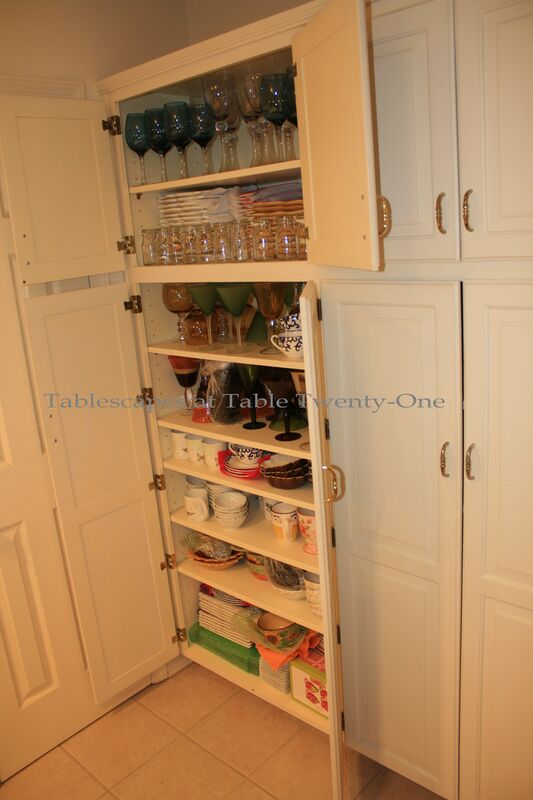 I love seeing storage maximized – you understand how to make great use of space. I love it! I am so glad I ran across your Blog! I love it!! Thanks for the inspiration!